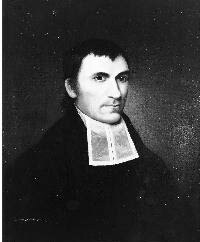 The Reverend Ira Condict was an American Presbyterian and Dutch Reformed minister who served as the third president of Queen's College in New Brunswick, New Jersey. A graduate of The College of New Jersey, Condict was ordained as a minister in the Presbyterian faith. In 1794, Condict was appointed as Professor of Moral Philosophy at Queen's College in New Brunswick, and subsequently asked to serve as its third president following the resignation of William Linn. Because the college had closed in 1795, Condict served in a pro tempore capacity from 1795 to 1810, dedicating his efforts to providing theological instruction and administering the Queen's College Grammar School which remained open during this time. After a difficult fundraising effort led by Condict, Queen's College was reopened in 1807 and he presided over the laying of the cornerstone for the college's Old Queens building on 27 April 1809.